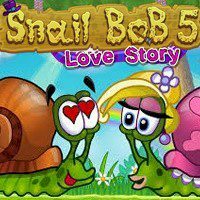 Snail Bob is in love and he wants to meet this beauty snail again. Help him to complete a couple of challenges! This is bob's love story where you can take straight participation. Help this snail to reach his love and remove obstacles on his way. Click button to rotate the snail and press red buttons to activate other things.